OffiSync is a beta application that allows you to access Google docs from Microsoft Office suite. You can edit documents from MS office and the changes you made will be synced to the online versions of the documents. You need to download the OffiSync plugin for Microsoft Office and setup. Once installed open any MS office application like word or excel you will see a new menu in the office ribbon. Login to your Google docs from Office application using the â€œOpenâ€ button from OffiSync menu, once logged in you can see all the documents you have in Google docs. 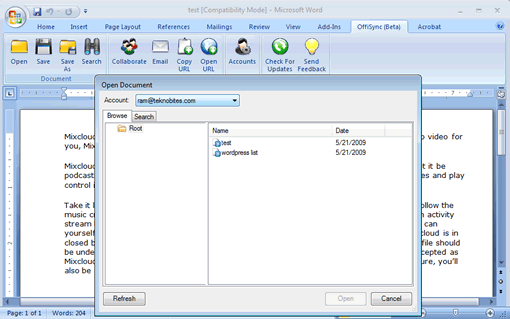 Select the document you want to edit it will be opened in the Office application like word and you can edit it. If you are accessing Google docs from Word you will only see .doc files, if you are using Excel you will only see excel files from your Google account. After editing you can save the document to your Google docs account by clicking â€œSaveâ€ from the OffiSync menu. If you use multiple accounts, you can setup multiple accounts using Accounts function. 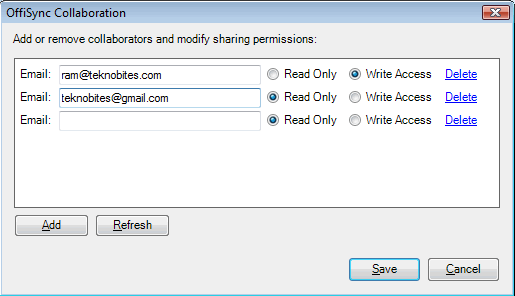 It is also possible to add collaborators to your documents so that other can see the document or edit it based on the permissions you setup. This is a beta application and requires .NET 3.5 framework to work. Other requirements include Windows XP, Vista, Or Windows 7 OS and either 2003 or 2007 version of the Microsoft Office. Is there anything similar that works with Office XP?